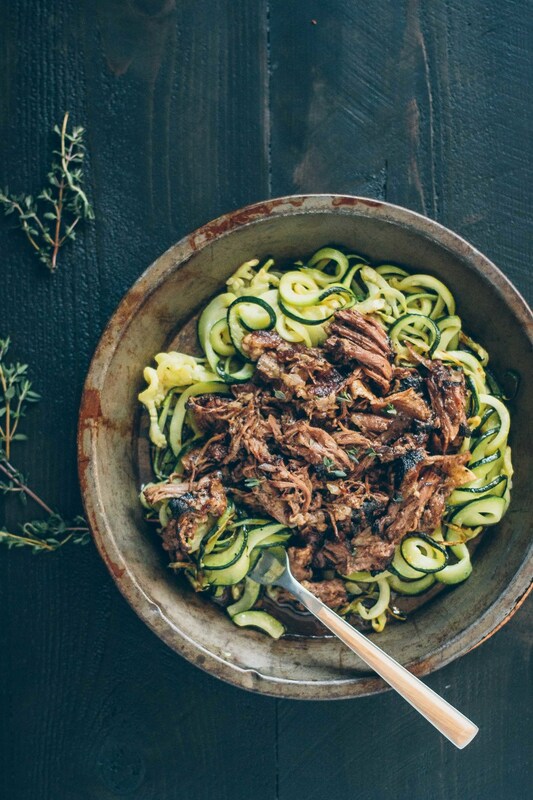 Short ribs that fall off the bone and zoodles you'll actually enjoy. Trader Joe’s has this amazing looking BBQ rub that I’ve wanted to replicate. I can’t say if this homemade version tastes the same since I haven’t tried TJ’s BUT it gave me some solid inspiration. Because this rub has so.much.flavor. I used the leftover grinds from my morning Bulletproof Cacao but seeing as how it’s what TJ’s does, I’m guessing coffee grinds would be equally amazing. Just make sure they’ve dried out after their use so they can grind up well with the other spices. FYI on the roasted zucchini noodles, this was my first go at it. There may be room for improvement but after a couple of test batches, I’m pretty happy with the results. The alternative of sautéing always yields water-y noodles for me that are so unappetizing. Roasting allows for more steam to escape, resulting in a softened noodle that still has some bite. I enjoyed them most with just a small bit of browning, as pictured, but you could experiment with cooking them longer for a more overall browning. Pat the short ribs dry and set them aside. Combine the cacao grinds, orange zest, garlic powder, paprika, onion flakes, and sea salt in a spice grinder, Vitamix, or Magic Bullet-style blender. Grind until well-combined and no large chunks appear. Coat the short ribs well with the spice mix, pressing in a thick layer on all sides. Heat a large skillet over medium-high heat and add a small amount of oil. Sear the short ribs until nice and browned on all sides. Move the seared short ribs to a crockpot set to high. Add enough bone broth to cover the bottom 1″ of the short ribs (it was about 1.5 cups in my 6-quart crock pot). Cook for 4 ½ to 5 hours, or until the meat is tender enough to easily shred right off the bone. Serve over top of the Roasted Zucchini Noodles with just a bit of the sauce created from the braising. Ensure your zucchini is spiralized to a medium width — too thin and it’ll brown too much and too thick and it’ll create too much steam. Line a large sheet pan with tin foil or parchment (your pan should be large enough to allow for a lot of room between the zucchini so the steam can escape, use 2 pans for larger zucchini). Pour about 1 teaspoon of oil and grease the liner very lightly. Add the spiralized zucchini to the pan and toss gently to grab some of the oil off the liner. Cook for 15-20 minutes, removing the pan halfway through to toss. Note: I’ve found it’s best enjoyed with just a small amount of browning on the edges but you can test the texture and stop cooking when you’re happy with it. Hey Angeline! (nice name :)) I have the Inspiralizer (inspiralized.com) but I’ve owned both the Paderno brand spiralizer and the Veggetti in the past (you can buy either on Amazon). The Inspiralizer is more expensive but I’ve found it spiralizes pretty much any veggie you want it to and very easily. The Veggetti is too small to handle much more than zucchini or squash. The Inspiralizer also has less moving parts than the Paderno (closest in design) which makes using/cleaning it much simpler. I hope that helps!